DealsIn Place all of your qualifying items into your shopping bag. Type the Promotion Code NWHOLLY into the Promotion code box in your shopping bag. Vera Shiminsky How to Save: At checkout, enter NWHOLLY in the promotion code box and click apply. 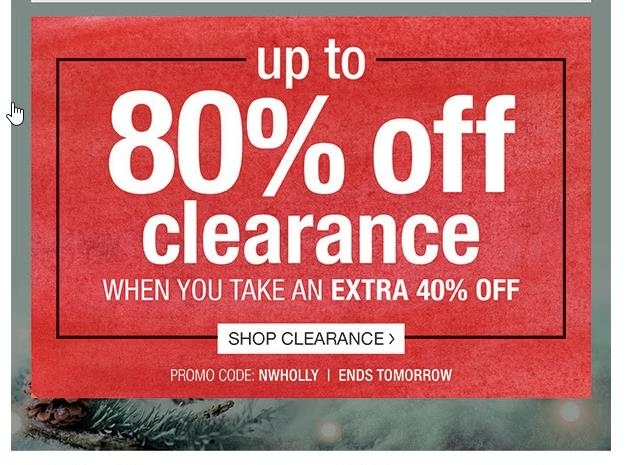 Exclusions apply: noted on web as "No promotions or discounts can be applied to this product." This offer is available online only and cannot be combined with other offers or used on previously placed orders. Promotion codes do not apply to international orders. Promotions and discounts do not apply to taxes or the purchase of gift cards. Offer valid until 11:59 PM PT, November 30, 2016. REDEEMING YOUR PROMO CODE: 1. Place all of your qualifying items into your shopping bag. 2. Type the Promotion Code NWHOLLY into the Promotion code box in your shopping bag. 3. Click apply to see discount.